Back cover blurb: Week after week, the postcards arrive, addressed to a name Ellie does not know, with no return address, each signed with an initial: A. With their bright skies, blue seas and alluring images of Greece, these cartes postales brighten her life. After six months, to her disappointment, they cease. But the montage she has created on the wall of her flat has cast a spell. She must see this country for herself. On the morning Ellie leaves for Athens, a notebook arrives. Its pages tell the story of a man's odyssey through Greece. Moving, surprising and sometimes dark, A's tale unfolds with the discovery not only of a culture but also of a desire to live life to the full once more. Victoria Hislop's latest novel is an absolute beauty, in all senses. From its glorious cover to its inside picture postcards and photographs of a Greece that is nothing short of magnificent. 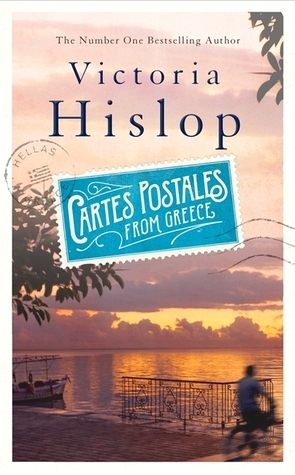 Cartes Postales from Greece begins with Ellie, who week after week receives postcards to her address. They are beautiful cards featuring bright blue skies and inviting seas, and soon Ellie has a montage of them. They are clearly not meant for her, instead they are addressed to an 'S. Ibbotson' and signed only from 'A', presumably 'S. Ibbotson' was the last person to live in the flat before Ellie. When the postcards suddenly stop, Ellie is left bereft, but the montage she has created over the weeks cause her to act spontaneously and organise her own trip to Greece. On the morning she is due to leave, a notebook arrives, Ellie is late having overslept and so hastily stuffs it into her bag. Upon her arrival in Greece, Ellie finally gets change to open the notebook, and its contents are even more magical than the postcards that came before it. Soon Ellie is transported into the life of 'A' as he travels around Greece with the little blue notebook an discovers a wonderful world of tradition, folklore, love and betrayal. Each story is set with accompanying photographs in glorious colour. Not only does this novel tell a wonderful tale, it also illustrates Greece beautifully and takes the reader on a unique journey to its heart. This is a very special book, and definitely a collectors piece for years to come. Cartes Postales from Greece is available from 22 September 2016. You can pre-order it now via Amazon online and all good book shops. Thank You to the publisher who sent me an advanced proof of this novel in exchange for an honest review.